Driving with a voice recorder & recording driving vehicles signs and build boards is a great way to get new website clients! 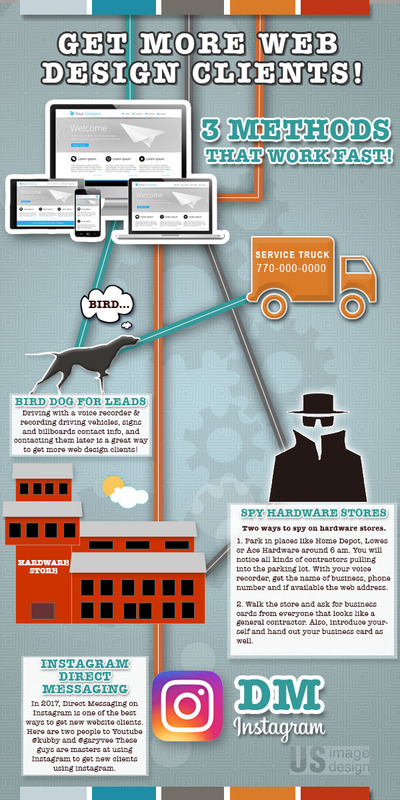 Two ways to spy on hardware stores. Park in places like Home Depot, Lowes or Ace Hardware around 6 am. You will notice all kinds of contractors pulling into the parking lot. With your voice recorder, get the name of business, phone number and if available the web address. Walk the store and ask for business cards from everyone that looks like a general contractor. Also, introduce yourself and hand out your business card as well. In 2017, Direct Messaging on Instagram is one of the best ways to get new website clients. Here are two Guys @kubby and @garyvee…they are masters at using Instagram to get new clients using Instagram. I use some of the tactics they teach myself to start growing my Instagram traffic and increasing sales. How To Form an LLC In GEORGIA for a NEW BUSINESS? EASY! 4 HUGE REASONS WHY LOCAL BUSINESSES NEED A WEBSITE 2017! US Image design has been working with me for 7 years with remarkable results. Very professional and friendly to work with. I highly recommend them if you want to be successful with your advertising. Keith with Clark Cabinet Shop. US Image Design did a wonderful job! They redesigned our outdated website and created an outstanding new interactive site that will undoubtedly bring in more clients for us. They are very professional and we would highly recommend them! Exceptional work! Wonderful Work, easy to work with to get a great Web Page, He has done a great design for Skydive Skyranch. I contacted US Image Design and worked with Tirrell. They helped me from start to finish and even gave me tips that would save my company money in other areas. My experience has been awesome and I would definitely recommend US Image Design to anyone looking for a website or getting an advertising campaign going. Very caring service. I felt very comfortable sharing my ideas about the website. The website was functional and beautiful. If you aren't satisfied with your website's performance. Contact us! If you are looking for someone to give you Web presence and create or enhance your brand, I highly recommend Web Designer Atlanta. One of the.most important parts of owning your own business is having a brand that separates you from your competitors. This guy can make it happen for you the first go round. Great personal touch always keeping page updated i noticed increase in business immediately highly recommend!!! So professional, and i felt like i was the only client, such great presonal attention, would highly recommend you give it a shot!!!! Impressive work! Wonderful people to do business with. I would definitely recommend to anyone who needs a website. US Image Design is a must have for all business owners. Very sweet spirited people and will treat you good. U.S. Image Design did my web page and I was very impressed with the boost in my business! They really know what they are doing. Great quality work! I encourage any business that does not have a web page to visit their site if you really want to grow your business and get your name out there! U.S. Image Design provides professional search engine optimization services to one type of customer; those that want results! We are a cutting-edge team of web designers and internet marketers using the best practices that help deliver measurable results. © Web Design and Internet Marketing Agency US Image Design.